Fun Casino will then reward you with a bonus (Welcome Bonus is for new players only). The terms and conditions of the bonuses vary between different casinos and might also change over time and between different countries, so it is important to compare the different offers and read the T&C for Fun Casino before signing up. 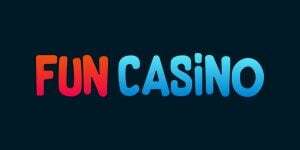 Fun Casino is a place for players to unwind and have some proper casino fun. Placing wagers without the pressure of having to win is bound to attract unexpected wins, at least that’s one way of looking at it. Fun Casino exists since 2017 and runs under a Maltese gaming license. The owner is L&L Europe Ltd. For customers residing in the UK, the operator acquired a license issued by the UK Gambling Commission, as well. The site benefits from an instant-play configuration which makes it loadable on smartphones and tablets anywhere, anytime. 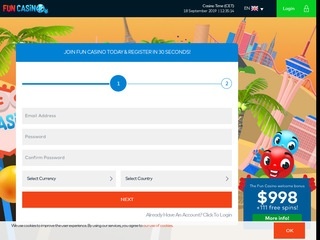 Fun Casino is a colorful online casino overall, but it leaves child’s play to the customers. The team takes customer treatment seriously and provides dedicated assistance as well as efficient banking methods. As for the content, the Fun Casino library has it all, from slots and video pokers to jackpots and live casino. Being a multi-software casino site, Fun Casino counts on hundreds of games coming from dozens of different studios. There are well over 600 gaming titles on display at Fun Casino, and these are divided into categories: video slots, jackpots, slots, live casino, video poker, table games and other games (scratch cards, bingo, virtual racing). Fun Casino offers games that are by no means an off-brand product. They are developed by the likes of Microgaming, Net Entertainment, Amatic, 1×2 Gaming and Evolution Gaming. You’ll be right to guess that slots are the most numerous, but you’ll be surprised how well-stocked the table games and live casino sections are, as well. There’s plenty of fun to be had at Fun Casino, no doubt. You can see slot collections every day with games simply added to the library without any order or logic. That is not the case with Fun Casino. At FunCasino.com all the slots are nicely organized into three groups: Video Slots, Slots (classic slots) and Jackpots. In each section, the titles are sorted in alphabetical order. Unfortunately, the absence of a search bar does not help with the browsing. Some of the best games on display are Agent Jane Blond, Avalon, Blood Suckers II, Book of Aztec, Dracula, Immortal Romance, and Jack Hammer. But that’s just our choice – you’re free to make your own list of favorites. Traditional fruit machines such as Hot Twenty, Jackpot 6000, Super Nudge 6000 and Wild 7 rarely get enough credit. As for jackpots, the choice comes down to the very best: Hall of Gods, Arabian Nights, Mega Fortune, Mega Moolah and Divine Fortune. Roulette, poker, blackjack and baccarat are all available at Fun Casino, in various variants. Registered users can try their luck with American Roulette, Baccarat Pro Low Limit/High Limit, Blackjack Double Exposure, Blackjack Single Deck, Casino Hold’em Poker, French Roulette and more. The collection also contains Pontoon, Punto Banco and Red Dog. Any video poker enthusiasts would rank the Fun Casino video poker assortment as highly as possible. The list of available games consists of titles such as Aces and Eights, All American Poker, Deuces Wild Multi Hand, Joker Poker and Tens or Better. For some instant fun (and instant wins) you can always turn to the Other Games section where you’ll find Electro Bingo, Premier Racing, Spingo, Four by Four and Cashapillar Scratch Card. The live casino featured at FunCasino.com is arguably the best of what Evolution Gaming has to offer. Players can enjoy different table limits, different studio settings, various friendly croupiers and games with rare side bets and unique features. The list is long, but to give you a taste we’ll mention Baccarat Control Squeeze, Blackjack Classic, Extreme Texas Hold’em, Three Card Poker, Blackjack Party, Immersive Roulette and Lightning Roulette. Payments made at Fun Casino are safe, secure and fast. The methods users can rely on are Visa card, MasterCard, Paysafecard voucher, Skrill e-wallet, Neteller, iDebit, Interac, Trustly, Sofort, Giropay, Klarna, and also bank wire transfer. As a minimum, customers are required to deposit 10 € and withdraw double the mentioned amount. Fun Casino is friendly to players paying in their local currencies and usually pays out winnings within 24 hours. Most of the time, it’s all fun and games at Fun Casino. But if you do need to settle a dispute or ask a question just because you’re curious, feel free to contact Fun Casino’s customer support team. The website employs trained support staff available in the English, Norwegian, Swedish, Finnish and German language. Another convenience is that you can use multiple options to contact the support agents: 24/t live chat, email and telephone. International charges may apply to telephone calls made from specific countries. As for email support, Fun Casino is proud to have a diligent team that replies to email queries within an hour.